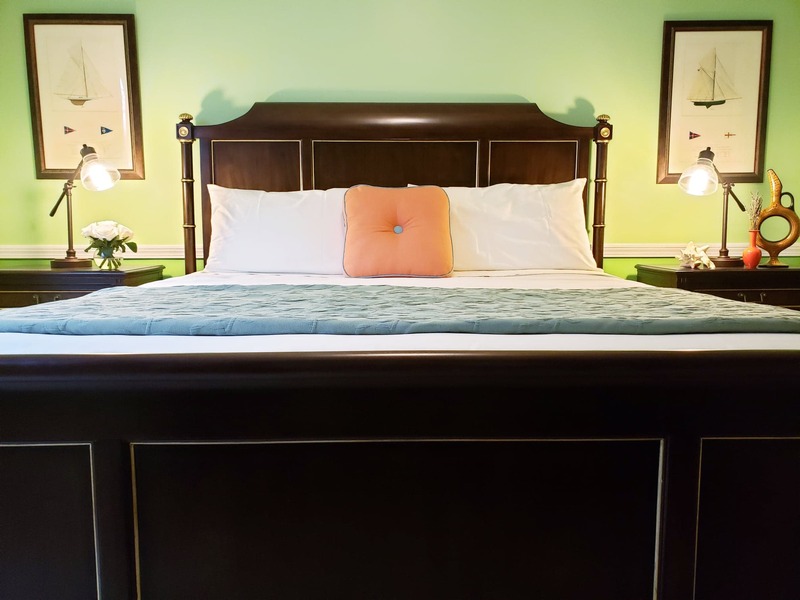 Each of our rooms is individually decorated in an updated Victorian style with select antiques and enhanced with today's most requested guest amenities. Many rooms also feature cozy gas fireplaces, spa tubs, adjoining "sitting rooms" and private porches. The nightly room rate also includes a hearty full breakfast and "Afternoon Tea." The room rates listed in the table below are single or double occupancy and exclude the Maine Lodging Tax of 9%. There are no additional service fees or charges. Amazon.com "Kindles" with daily editions of NY Times and Washington Post newspapers. Click here for a virtual Tour of the inn! This first floor two-room suite features a romantic king-size "Wesley Allen" cast iron canopy bed with luxurious pillow-top bedding and a cozy gas fireplace in the bedroom and a beautiful porch right outside its private entrance. The adjoining sitting room includes a comfortable twin daybed, two wing chairs and an additional flat-panel television with a built-in DVD player. The private bathroom has the added feature of a Kohler "BubbleMassage" air-jetted spa bathtub for relaxing after a day in Acadia National Park. This first floor room features beautiful Maine "cottage-style" furniture, a romantic king-size bed with luxurious pillow-top bedding, a cozy gas fireplace and a private porch. The private bathroom has the added feature of a Kohler "BubbleMassage" air-jetted spa bathtub for relaxing after a day in Acadia National Park. This second floor room features high ceilings, a queen-size bed with luxurious pillow-top bedding, a cozy gas fireplace, plenty of natural light from its seven windows and a private balcony overlooking the front of the property. The private bathroom has a beautifully tiled walk-in shower. This second floor room features high ceilings, a romantic queen-size four-poster bed with luxurious pillow-top bedding and a cozy gas fireplace. The private bathroom has the added features of a whirlpool spa bathtub for relaxing after a day in Acadia National Park and a period marble sink. This second floor room features high ceilings, a queen-size bed and a private bathroom with the added feature of a Kohler "BubbleMassage" air-jetted spa bathtub for relaxing after a day in Acadia National Park. This second floor room features beautiful Maine "cottage-style" furniture, high ceilings, a romantic king-size bed with luxurious pillow-top bedding, a cozy gas fireplace, a private bathroom with a “Bubble Massage” air jetted spa bathtub and a private balcony overlooking the gardens in the front of the property. One of our "Mini-Suites," this second floor room features a queen-size bed, a private bathroom and an adjoining "sitting room" that gives guests extra room to "stretch out." The sitting room includes a comfortable twin daybed that guests can use to relax and enjoy a good book after a busy day of activities in Acadia National Park and can also accommodate a third guest in the room. This second floor room is one of our coziest rooms and features a queen-size bed and a private bathroom. One of our "Mini-Suites," this second floor room features a queen-size "Wesley Allen" cast iron bed, a private bathroom and an adjoining "sitting room" that gives guests extra room to "stretch out." The sitting room includes two wing chairs that guests can use to relax and enjoy a good book after a busy day of activities in Acadia National Park. This first floor room is one of our most popular rooms and features a queen-size bed and a private bathroom with a roomy walk-in shower. The room has the added feature of a private porch overlooking the front gardens. This first floor room features high ceilings, a romantic king-size bed with luxurious pillow-top bedding, a cozy gas fireplace and a private porch. The private bathroom has the added feature of a Kohler "BubbleMassage" air-jetted spa bathtub for relaxing after a day in Acadia National Park. One of our "Mini-Suites," this first floor room features a queen-size "Wesley Allen" cast iron bed, a private bathroom and an adjoining "sitting room" that gives guests extra room to "stretch out." The sitting room includes two wing chairs that guests can use to relax and enjoy a good book after a busy day of activities in Acadia National Park. One of our "Mini-Suites," this first floor room features a queen-size bed, a private bathroom and an adjoining "sitting room" that gives guests extra room to "stretch out." The sitting room includes a desk and a wing chair that guests can use to relax and enjoy a good book after a busy day of activities in Acadia National Park. This spacious second floor two-room suite features beautiful Maine "cottage-style" furniture, a queen-size bed in the bedroom, two wing-back chairs and a twin daybed in the adjoining sitting room, the private bath has the added feature of a “Bubble Massage” air jetted spa bath tub and air conditioning. This spacious second floor two-room suite features beautiful Maine "cottage-style" furniture, a queen-size bed with luxurious pillow-top bedding and a cozy gas fireplace in the bedroom. The adjoining sitting room includes two wing chairs and an additional flat- panel television with a built-in DVD player. The private bathroom has the added feature of a Kohler "BubbleMassage" air-jetted spa bathtub for relaxing after a day in Acadia National Park.